An innovative trend combining technology with economics is unraveling behemoth industries—including corporations, banks, farms, media conglomerates, energy systems, governments, and schools—that have long dominated business and society. Size and scale have become a liability. A new generation of upstarts is using artificial intelligence to automate tasks that once required expensive investment, and “renting” technology platforms to build businesses for hyper-focused markets, enabling them to grow big without the bloat of giant organizations. 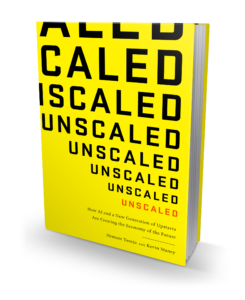 In Unscaled, venture capitalist Hemant Taneja explains how the unscaled phenomenon allowed Warby Parker to cheaply and easily start a small company, build a better product, and become a global competitor in no time, upending entrenched eyewear giant Luxottica. It similarly enabled Stripe to take on established payment processors throughout the world, and Livongo to help diabetics control their disease while simultaneously cutting the cost of treatment. The unscaled economy is remaking massive, deeply rooted industries and opening up fantastic possibilities for entrepreneurs, imaginative companies, and resourceful individuals. It can be the model for solving some of the world’s greatest problems, including climate change and soaring health-care costs, but will also unleash new challenges that today’s leaders must address. 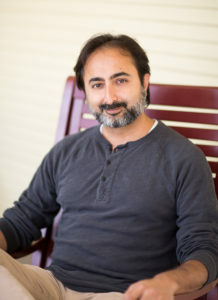 Hemant Taneja is a managing director at General Catalyst, a venture capital firm with offices in San Francisco, Palo Alto, New York City, and Boston. In his civic life, he has co-founded Advanced Energy Economy, an organization focused on transforming energy policy in America, is a board member of Khan Academy, a non-profit educational organization, and serves on the Stanford School of Medicine Board of Fellows. He also lectures at MIT and Stanford University and has published articles about the unscaling phenomenon in the Harvard Business Review and on TechCrunch.